You rarely hear about California brandy. It's always the stuff from Europe that garners attention. Not that there isn't amazing brandy made in California (Germain-Robin for example), it's just not that big of industry here in American compared to say our wine or craft beer cultures. The good thing about brandy made here in the states is that it tends to be cheaper on average. 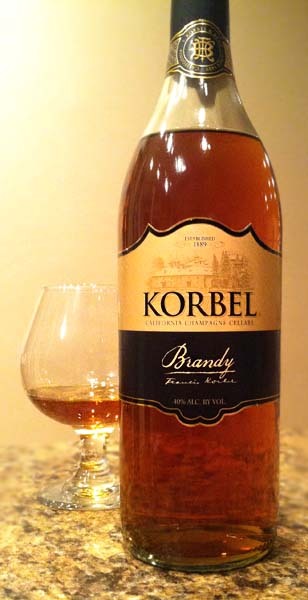 Case in point, this brandy, the Korbel California Champagne Cellars Brandy. I picked this bottle up on sale for $8, while retail is still only something like $11. Now that's ridiculously cheap. The Korbel Brandy is aged in semi-charred American oak barrels which lends some unique characteristics. It has a fairly deep color for a young brandy, mostly due to the charcoal oak aging, much like bourbon. It has aromas of grape juice, caramel and a hint of smoke and ethanol. Tasting brings a some generic wine flavors, a bit of sweet caramel and apricot, and more of the hints of smoke and oak, with the alcohol presence being noticeable but not as much as I was expecting for such a cheap brandy. All in all, one of the better super cheap brandies I've tried. It's not great by any means, but it's a brandy that I could easily have a drink of while I'm using it to cook a sauce with. It's not overly sweet like many cheap brandies, but it's also not overly hot and boozy. Still, if I want a brandy purely for drinking I'm much more likely to spend another $20 a bottle and buy something a bit more elegant and maybe with a silkier mouthfeel. But at this price (~$11 or less), it's hard to complain. Drink This: if you want a super cheap brandy that's perfect for cooking, but good enough to have a drink or two of.